Notice : Activation key must be used on a valid Steam account. Requires internet connection to install.The game activation will NOT work from these territories: Japan, Taiwan, Hong Kong, North/South Korea, China.ABOUT THE GAMEAlien Breed™ 3: Descent is a science fiction arcade-shooter with an epic story, swarms of highly intelligent alien enemies, high-impact weapons and stunning environments, d… eveloped using Epic Games' Unreal® Engine 3. Descend into hell and once again take control of the hero, Conrad, the ship’s Chief Engineer, in his last stand against the savage alien horde. While the doomed vessel, the Leopold, and the alien space craft plunge deeper into the planet’s atmosphere, with an icy ocean promising a watery grave, you have just hours to defy a grisly death and survive the alien onslaught for the final time. As you struggle deeper into the sinking alien ship, through the freezing waters flooding every corridor, the horrifying truth surrounding the existence of the Breed is finally uncovered… In addition to the thrilling conclusion to the single-player campaign and the relentless and competitive “Survivor” modes, the game offers action-packed, two-player online co-operative battle modes. KEY FEATURES Alien Breed™ 3: Descent - The stunning final chapter in the Alien Breed™ trilogy - an action-packed mix of arcade-shooter, survival-horror and tactical weapons upgrades and customisation. The final descent into hell! NEW - Set pieces – battle the breed through flooded levels and hull walk sections. NEW – Third-person action - take control of the hero, Conrad, in the new action-packed, third-person, sections. NEW – Fight the last stand armed with powerful new weaponry: The Project X is a ‘BFG’ that vaporizes everything it comes into contact with. The Electro-Link gun fires bolts of electricity and also sends chain lightning to damage nearby enemies. NEW – Survive new alien enemies – the ‘Electro-shocker’ and dramatic encounters with the final horrifying bosses. Epic single-player Story mode - The final chapter in the single-player campaign mode that concludes the thrilling narrative of the game through huge and challenging environments, including the new research lab level. Single-player Survivor mode: Resist endless waves of intense alien horde attacks in specifically designed arena environments. Single-player Free-play mode - A single-player challenge mode – beat your high score on a previously completed campaign mission. Two-player Co-operative play mode – Work together to defeat the alien horde across three specially customised assault maps for two players online. Two-player Co-operative Survivor mode – Join forces online and try to survive three specifically designed arena environments. Get competitive and challenge others online to beat your survivor abilities on the extensive Leader-boards. Additional Online features - Quick Match/Create Game/Friends Lists/Voice Chat/Leader-boards/Steam Achievements/Co-operative Achievements. Upgrades shop – Search fallen comrades and lockers to accumulate cash, and then tactically spend it on weapons/kit upgrades in the in-game shop. Playable demo/trial - A purpose-designed, action-packed free sample section of Alien Breed™ 3: Descent, called ‘The Prologue’, which also features a time-limited Survivor mode map. SYSTEM REQUIREMENTS Minimum : OS:	Windows XP SP2 or later CPU: 2.0+ GHZ Single Core Processor RAM: 1GB RAM HDD: 1.5GB GPU: NVIDIA 6800+ or ATI Radeon X700+ Video Card Sound:	Windows Supported Sound Card DirectX®:	9.0c Controller support? Yes Any special multiplayer requirements? Internet connection required. 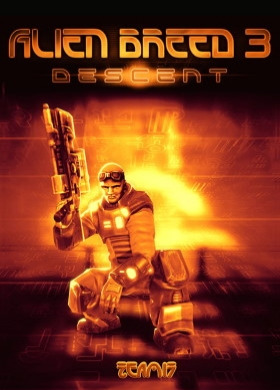 Alien Breed™ 3: Descent. Developed and Published by Team17 Software © 2010. Team17 Software and Alien Breed™3: Descent are Trademarks or Registered trademarks of Team17 Software Limited. All rights reserved. All other trademarks, copyrights and logos are property of their respective owners. Unreal® Engine, Copyright 1998 - 2010, Epic Games, Inc. All rights reserved. Unreal® is a registered trademark of Epic Games, Inc. All other trademarks are property of their respective owners.